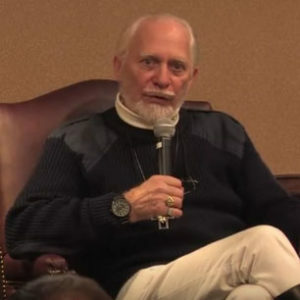 Douglas Gresham (stepson of C.S. Lewis) will be speaking at Wheaton College in Wheaton, IL tonight. The event will be streamed live beginning at 6:55pm CST. Professor of evangelism Dr. Jerry Root will interview C.S. Lewis’ son, Douglas Gresham, about Lewis’ legacy as an evangelist. Singer-songwriter Meg Sutherland will perform songs from her debut album, “Courage, Dear Heart,” which features songs inspired by the creative legacy of Lewis. Evangelism and C.S. Lewis is sponsored by the Billy Graham Center for Evangelism and the Marion E. Wade Center at Wheaton College. We will see if he offers any new information about The Silver Chair. View the stream here. UPDATE 4/18/17: View the recording of the event. You can also read our notes. The event begins with a few songs from Meg Sutherland. Gresham unsuccessfully tried to get her song “Real” into the closing credits of The Chronicles of Narnia: The Voyage of the Dawn Treader. Even if he doesn’t say anything new about Silver Chair this should be interesting to watch. He didn’t say anything about The Silver Chair. But it was worth watching anyway he’s a very good specker and has lot of interesting things to say. Now I’m wondering if it’s 2 Narnia films! Someone correct me before I get my hopes up. I haven’t listened to it yet. No new info but that’s okay, he was so amazing and fun to watch. I wanted to cry when it was over! Meg’s music is beautiful as well! I totally agree! Music doesn’t get much more Narnian than hers! Is this still available to watch somewhere? I’m wondering the same thing! I had to miss it. I am wondering the same! I watched it but I would love to share it with my friends! Wheaton College seems to put a lot of talks and such on thier YouTube channel, so maybe it will be uploaded there. do you any link for the recorded stream?.. I looked in Wheaton College’s channel on Youtube but it’s not there. "We will update this post if a recording is uploaded." I enjoyed Screwtape Letters 50+ years ago. Bu Shadowlands, oah! I must not think about it in another’s company. I don’t cry in front of others. Thinking of Lewis and Greshen bursts me into tears. Wonderful tears…but sill tears!